Well here we go again. More politicians have decided they are experts on food packaging. This time it’s New York state (Genpak’s home state by the way). 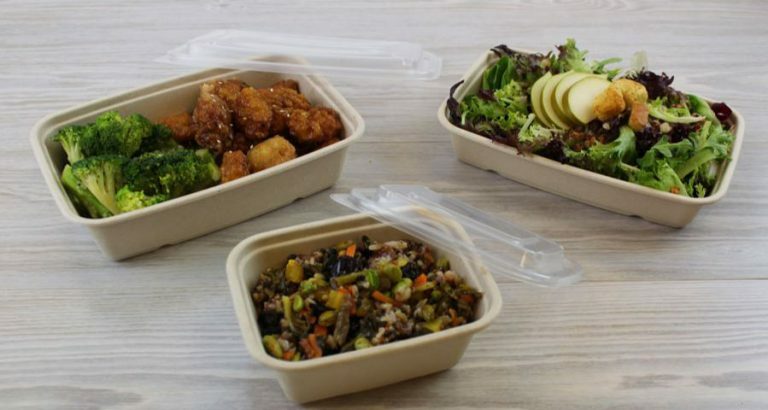 State Senator Liz Krueger and Assembly member Brian Kavanagh have teamed with others in an attempt to ban the use of foamed polystyrene food service products in governmental offices and public schools. They kicked off this witch hunt by holding a rally on Earth Day at a Manhattan school, standing next to a giant pile of polystyrene products. They have also begun recruiting elected officials to sign their SPARE (Stop Polystyrene And Revitalize the Environment) pledge. I guess this document forces governmental office buildings to find other, (more expensive) forms food service packaging. Ms. Kruger went on to say she was proud to be part of something that will ban products blah blah blah, toxic to the environment blah blah, etc etc. All the same rhetoric that is mostly all false or half true. Here’s what I think. Election day is right around the corner and if you are an incumbent, you’re fighting for your political life. Especially in New York where once again we have no budget in place because of all the political bickering. Hey, let’s find an easy target we can pick on that will make us look like good guys in the voters eyes. Styrofoam! Yes there we go, lets ban Styrofoam! Let’s face it, foamed polystyrene (Styrofoam is a trade name by another company) is an easy target due to huge consumer misconception…partially fueled by the misinformation piled on by folks like this. These politicians make up neat acronyms like SPARE and stand next to a giant piles of garbage talking about the ills of the material. Most of what they are saying are totally incorrect. I’m not going to go into all the misinformation Krueger and Kavanagh are saying on this post, but if you are interested, I’ve posted before regarding all the misconceptions of foamed polystyrene. They don’t take long to read and it’s real information offered by someone not looking to be elected. One thing that should be said here is if they are successful, taxpayers in NY should know that most of the alternative materials available are significantly more expensive than foam. Yes there are alternatives. I know because we sell a ton of it with our Harvest label products. It’s compostable and made from annually renewable resources. But, unfortunately, it is more expensive. Given the economic crisis the politicians have put New York State in, I would think they should be looking for any savings they can get. Spending 15% to 20% more for alternative food service packaging is probably not the wisest choice at the moment. Listen, I’ve said this before and I’ll say it again. We are not against alternative materials for food packaging. Far from it. Genpak is leading the charge for alternative materials. We have products made from annually renewable resources, products that have been significantly source reduced, products that are #1 recyclable, products that are produced with up to 50% post consumer recycled content and products produced from hybrid materials that replace a significant portion of the petrochemical resin with natural, annually renewable materials. What I’m against is politicians finding a business sector to regulate and control without knowing the facts, to make them appear grand in voters eyes. I propose instead of SPARE they initiate DUMB (Don’t Usurp My NYS Budget) or perhaps STUPID (Stop Tying Up taxPayers Invaluable Dollars) and get to work on passing a budget for this great state. 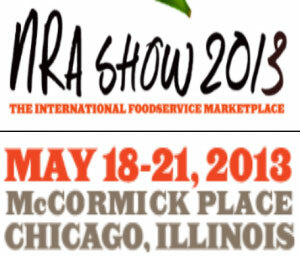 Let the food service markets and industries make their own natural progression toward the materials and substrates that make the most sense environmentally and economically. It’s a brand new year and we’ve got a brand new product line to talk about. Before we get into that, let me lay a little ground work if I may. We had a national sales meeting up here in sunny Glens Falls a couple weeks back. After a few of our fair weather sales people stopped complaining about the snow, we got down to business and had a couple productive days. I think the main theme I took away was summed up by a phrase that will reign true throughout this year and years to come. That phrase was, “this is not your mother’s Genpak“. We were challenged to think outside our comfort zone and not to fall back on that comfy security blanket we call the foam hinged container. The gauntlet was laid to sell a greater mix of our ever growing product offering and push the envelope into the markets that will benefit the most from our superior designs and substrates. By the end of the meetings our entire group was pumped up and ready to dive into 2010 with both feet and with a bag full of new products…which leads me to our January spotlight. Harvest Fiber! Harvest Fiber is our next generation of eco-conscious food packaging products. Before you ho hum yawn this one away as another Johnny-Come-Lately line of earth friendly products, remember who you are dealing with here! Genpak was first to market over three years ago with a full line of eco products. And, as a leader in the single use food packaging industry and one of the pioneers of “green” food packaging, we wanted to make sure these products could meet our motto of Quality To Go. Now, what really sets our Fiber products apart from the field is our design. I’m not going to try to mislead you or gloss over facts here. 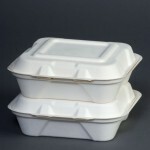 Like everybody else who supplies products made from Bagasse, they are made in China. This mainly due to the lack of supply for that type of raw material here in the US. Please rest assured that we did not partner with the lowest bidder however. We visited, talked with and audited suppliers until we were 100% comfortable with our choice. One of the main reasons we went with who we did was we needed a company that would make products to our own design specifications. In other words we did not buy off the rack as everyone else has done. We took our time and had custom molds made to our spec so the products we did launch, looked and worked just like the Genpak products our customers are used to. 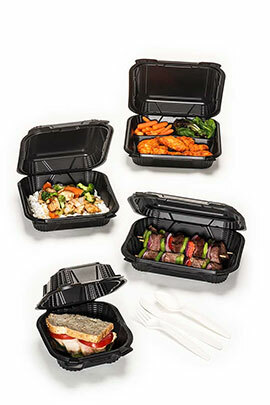 If you’ve ever fumbled and cursed at that typical slot and tab type closure that is rampant in the fiber hinged market, you will absolutely love our hinged containers. Why? Because it is our Snap-It style design. Easy to close and stays closed. 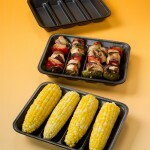 For you visual types, to see more pictures of our new Harvest Fiber food service products, just follow this link. If it is samples or more information you are after, just drop us a line and we’ll get right back to you. Let us know what you think. Reply back (make it clean) and we’ll post your comments.